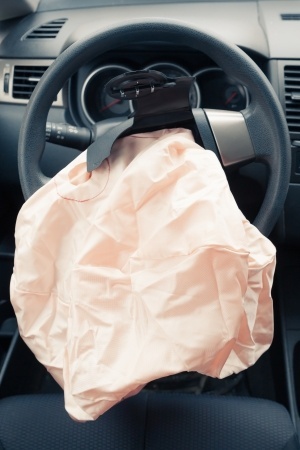 Airbag Failure: Where's the Liability? When someone incurs injury from an accident, a personal injury attorney investigates using proven methods to find any and all persons or entities that may be responsible for the accident in part or as a whole. One of the reasons an accident can occur is if there are problems with the air bags in a vehicle. Not everyone is aware that there can be more than one person responsible for an accident. Car manufacturers and airbag manufactures can also be found negligent and held partially or totally responsible for the accident and injuries. In the simplest of terms, air bags are big, soft, bags of air that erupt from the dash of a car to cushion the passenger in case of an accident. Like most everything else on a vehicle, air bags can be defective and will not always work correctly or at all. In these cases the manufacturer may be found liable for damages in the accident. In 1998, cars were required to be manufactured with driver and passenger front air bags. Studies pointed to as much as a 30% drop in car accident fatalities when airbags are used. Used and installed correctly, airbags can save lives. However, if they are improperly installed or tampered with, they can be as deadly as any accident. Manufacturers can make mistakes. Computer software snags, humans err. It happens. If the air bag was defective from the manufacturer they can be held liable for damages if the air bag did not deploy or only partially deployed. If the airbag was installed incorrectly it may never deploy or only partially disengage. Since the car makers expect air bags to work properly there may be some areas of the car that aren’t as protected on their own. If airbags fail great injury can occur. If airbags were incorrectly installed by the car maker they can be responsible. Often, a car seller or individual will have the airbags serviced or re-installed by an aftermarket party. If this is the case and the airbags fail to protect the vehicles inhabitants, they can be held responsible for any and all damages including death.